American football's top professional league, the National Football League (NFL), kicked off a few weeks ago but is now primed to make this year's international debut over the weekend at Wembley Stadium. 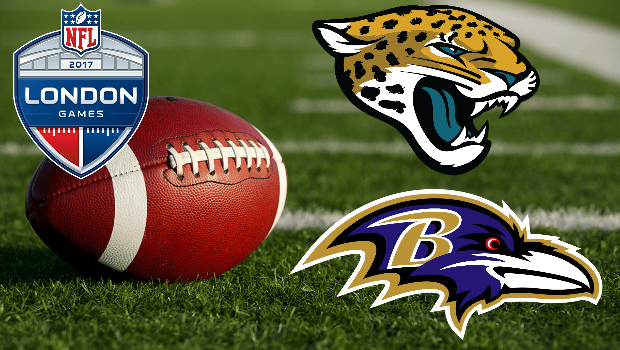 Breaking down the Jaguars bout with the Ravens this Sunday, we highlight all the best bets and odds from the top online bookies! The journey to the Superbowl, also known as the ‘Greatest Show on Earth’, is a long and winding one for all the 32 NFL franchises battling it out during the 2017/18 campaign, and once again the competition will make its customary stop-off in London as part of the NFL International Series. For the past decade, the NFL roadshow has packed its bags and crossed the pond to London for a series of regular season matches, and 2017 is no exception. England's Wembley Stadium is ready for a fantastic four fixtures to be played from September 24 to October 29, with the Jaguars vs Ravens set to kick it all off! First up in the 2017 NFL International Series is a clash at Wembley Stadium between the Baltimore Ravens and Jacksonville Jaguars. At this early stage of the campaign, the Ravens top the AFC North table and they will be determined to maintain their 100% record against the Jaguars, who have played more overseas matches than any other team in NFL International history. The following Sunday, October 1, sees the New Orleans Saints and the Miami Dolphins strut their stuff on the hallowed Wembley turf. The Dolphins’ last game against the Tampa Bay Buccaneers was postponed due to the effects of Hurricane Irma, and so they’ll be itching to make up for lost time against a Saints outfit that have been comprehensively beaten in their opening two matches. The second part of the UK leg of the NFL International Series switches to Twickenham Stadium, the famed home of the England rugby union team. Making their bow there on October 22 are the Arizona Cardinals and the Los Angeles Rams – both of whom will be eyeing the top spot in NFC West with victory on British soil. A week later the Minnesota Vikings – desperate to reach the Super Bowl on home turf – take on the Cleveland Browns in a cross-conference game. The Vikings were defeated 9-26 by the Pittsburgh Steelers on September 17, while the Browns went down 10-24 to the Baltimore Ravens on the same day, and so both sides need to up their game and start climbing their respective divisions. The trip to London can often do strange things to those involved - for more on this, check out our guide to NFL betting outside the US - and the formbook can be ripped up, but the Baltimore Ravens are on such a hot streak at the moment that they cannot be overlooked by punters. They are priced at 1/2 with the sportsbooks to win the match and odds of 10/11 to clear a four-point spread. And that latter wager appears to be sensational value given how the Ravens have started the campaign. They have conceded just ten points in their opening pair of encounters, defeating Cincinnati 20-0 on Sept. 10. This came prior to that resounding 24-10 victory over the Cleveland Browns last time out. The Baltimore outfit will now be looking to start the season 3-0 for the second campaign in a row. Key to their success has been the form of quarterback Joe Flacco. Flacco, even at this early stage of his career, is completing 66.7% of his passes for 338 yards gained. But the Ravens’ defensive line deserves all of the praise it's getting at present, with the combination of CJ Mosley (18 tackles) and Terrell Suggs (three sacks) creating plenty of turnover ball. The Jaguars have a slight advantage in the sense that they have participated in four NFL International Series matches in the past (2013-16), whereas the Ravens are making their debut on foreign shores. The Jacksonville side are experienced in handling the media circus that accompanies these events. The Jags can also handle the variable weather conditions which at least gives them some kind of edge over an unbeaten opponent approaching unchartered territory. Doug Marrone’s team have started the 2017/18 season in mixed form. They opened up with a comprehensive 29-7 win over the Houston Texans on September 10. But Jacksonville followed this win up with a rather one-sided 16-37 defeat to the Tennessee Titans a week later. Their defence ranks second only to the Ravens as far as turnovers created, and so from a betting perspective with two in-form defensive lines the smart play could be to back the Under 40.5 Points mark at 5/6 with 888sport. Betting the points spread market in American football is highly suggested, so the purists will be tumbling over themselves to get behind the Ravens at the -3.5 spread, which is available at a best price of around 25/28. No matter which of the ‘fantastic four’ you decide to get behind, you’ll find all the odds visiting 888sport today!